Posted on 04-May-2013 Categories ComputersTags APC, fail, support, webLeave a comment on Pretty Lame, APC! Posted on 16-Mar-2013 Categories Computers, Popular CultureTags language, search, web, wtfLeave a comment on Web WTF? Posted on 10-Mar-2013 Categories ComputersTags error, fail, oracle, webLeave a comment on Oops! Mark Gritter had the idea of analyzing his school’s homepage. So I’m going to analyze Carleton’s. I score that 4/8 (I’m not scoring #2). List of faculty phone numbers and emails — “Faculty and Staff” link then “Campus Directory”. I score 7/9 (I’m counting things that are indirect links but the chain is “obvious”; obviously this is subjective). 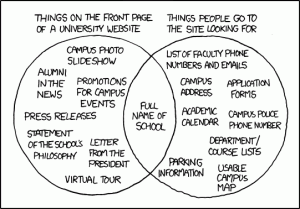 So, not nearly as bad as one might expect; Carleton actually has a higher proportion of the things people look for than they do of the things XKCD lists as always present. The emergency number is something I never would have thought of, and is probably a good idea. The page does give the main switchboard number. When I was there that was staffed 24 hours a day, but I don’t think it is any more. And it needs to give the external number for emergencies, since people finding that from the web site will mostly be calling from their cell phones. Carleton would never call it the “campus police”, of course. I’m tempted to snottily say that there’s no parking information because Carleton doesn’t allow parking—but in fact they’ve built a lot of parking lots since I was there, though still not nearly enough for student cars to be common. It’s not in a crowded metro area, and most of the time you can just park on the street fairly close, and the rest of the time you have to park on the street further away; but it should explain that somewhere, and I didn’t find it, even in the “travel by car” section of the campus visits page. This iteration of the Carleton site is actually pretty decent.